Sorry the tutorial is so long, but that's just how I make 'em! Hopefully it'll be useful to you all. If you have any questions, feel free to ask. I'm here to help. If you find any errors, please tell me so I can fix them. Why the brush stroke isn't willing to convert the same way. Shame on that tool ~ may it be ashamed! Wow, now that I look at it, while zoomed out, it really does look long. Either way, it showed me some essential steps, which I could do nothing without ~ regardless of my experience with Adobe products. For that, I thank you! Hopefully, I'll be able to do stuff, like pasting a vector part on top of another to make an exact "cut" ~ just like things work in flash, if you try to put them on each other. Tut is amazing. I didn't know you could turn lines into fills like that! Would have saved me a lot of time if I did! Drink a coffee, and it won't be boring to read. Videos are great, but you remember what you read more easily. Adobe Illustrator 10, though it should work with most versions of Illustrator. Thank you so much for this! I made a thing with it. After tranforming the lines to outlines, there is a way to change them back to lines? Unfortunately, no. That's why you have to make sure you have the lines right before you change them, or it's a pain to move them around afterwards. I use CS6. But sometimes I find better to turn the line into outline than using the width tool. No problem! Unfortunately, you'll have to use the width tool if you want to easily adjust your lines afterwards. If you can manage otherwise, then awesome. This.....this is so helpful I finally understand how to do vectors in this program! Thank you SO MUCh. hi. i have been trying to use this tutorial but the way to make thin ends is just not explained well enough. what do you mean by "select the end bit and delete it"? i can't select the little nodes or whatever, nothing happens when i click them, and when i drag and select HALF of the line disappears when i click delete. there's no little lines i can move, the whole line just moves when i try. Right, I do realize that wasn't super well-explained... So, after you convert the path to outlines, select the Direct Selection Tool (the white arrow). Now, imagine you have a long rectangle. There's two ends on it - the short line segments. You have to click on that end line segment, then hit delete. Only the end line segment should disappear. Don't click and drag, just click once on the end line segment. If the whole thing disappears when you hit delete, you accidentally clicked inside the shape, thus selecting the whole thing, not just the line. Try again. If you still can't get it after that, ask again and I'll make a diagram for you. Oooh, thanks for this. XD This makes SO much sense now! Oh, my bucking pony... I just finished making my first vector art of my changeling OC. I wish I had known about the "Draw Inside" tool. Lo siento, no sé españoles, sólo puedo utilizar Google Translate. Yo no voy a traducir todo el asunto. Tal vez usted puede encontrar algunos videos que ayudan? I'm having tons of issues with the anchor handles. Doing big mac(if that matters), I notice I am having lots of issues knowing when to put in an anchor point with or without a handle, and when I do, a lot of the time I find it goes all bonkers sometimes and the directions are wrong, or the end cap is rounded when I want it sharp or sharp when I want it rounded. I also find that even on a simple round edge like the rump, I am having issues getting a nice curve without random little hiccups in it. I couldn't really explain it better unless I showed you in video of me doing it(which I can do) or if I simply sent you the file as it stands. I really want to be able to make vectors of my own for animation in flash, but this is really turning out to be a big hurdle for me. Best I can do is tell you to practice more. I'd recommend checking out MLP-VectorClub, downloading some SVGs, and seeing how other people do it. I wish you the best of luck, and I'm sorry I couldn't be more helpful. That's just the kind of thing you have to practice. Thanks anyhow, after coming back to the vector, I think it is actually not turning out bad, but I'm just being maybe a bit hyper critical. Once I finish, I'd be honored if you gave me some constructive feedback. Thanks for this guide, its long and detailed, which is exactly how I like it. Send me a message and I'll definitely check it out, and thank you! Thank you for this and part 2 too! I have Illustrator CS5 but I can't make the lines end in a point. Is there any other way to do that? 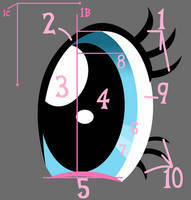 There is the method in the tutorial, or you can use the width tool. Look in the description for a link on how to use it! Nope, unfortunately. Inkscape is free, but this tutorial won't work very well with it. I'm not sure if I should be holding down alt or ctrl when I have to delete the end of the path, but either it deletes an anchor or the whole lines deletes completely. You need to use the Selection Tool, not the Direct Selection Tool. And make sure you click only on the last line segment, not the fill or anything. Couldn't you do that on gimp? Like outline in another layer and then make the other layer invisible and color over it with paths tool? I suppose, yes. But it wouldn't be a real vector, and if you zoom in on it, it'll just get pixellated. I only have Photoshop CS3, can I still use this? I really want to learn how to do this. Well, kinda. This won't apply for a lot of the step, because Photoshop doesn't do vector stuff very well. You'd be better off getting Illustrator or finding a photoshop-specific tutorial. Okay, this looks great even if I can't use it. Thank you very much for this tutorial. I hate videos that go at their own pace and either waste time or leave you behind, so I was really glad to find a written Illustrator tutorial. I've dallied in pony drawing for awhile, but just opened Ai the other day in hopes of getting that perfect smooth look only vectors seem to be capable of. Before I found your explanation, I could not for the life of me figure out how to point the lines! Moving on to part two now. I don't know if someone could answer this for me, however I'm having trouble just going from the lines to the lines with the black around it. I have Illustrator CS so I'm sure it's in there somewhere, but I just can't find any tutorial telling me how I can make that border around those lines. (maybe it's that arrow under the x which I can't seem to find). So yeah, that's my only problem that I'm having right now with it. Great tutorial otherwise! I'm assuming what you have right now is a line with a stroke on it? Just select it with the regular selection tool, and go to Object > Path > Outline Stroke. Then you should have a shape with a fill and no stroke. Take away the fill, give it a stroke, and there you go! Perhaps you actually need to use the other one? But it should be the direct selection tool. Make sure you're clicking actually on the actual point or line segment, not the fill or anything else. Yeah, it seems to be doing it a bit randomly for me, though I may just zoom in more. But what I do need is lots of practice, which I will hopefully have enough time for XD It seems pretty fun so far though. Thanks for all your help!